Description: The Beckmann rearrangement is a reaction of oximes that can result in either amides or nitriles, depending on the starting material. (Oximes derived from ketones form amides; oximes derived from aldehydes form nitriles) Notes: Note that the first step (formation of the oxime) is technically not part of of the Beckmann rearrangement. The Beckmann is the rearrangement of the oxime to the amide. This is generally achieved through conversion of the oxime oxygen to a good leaving group, followed by heat, which results in an alkyl (or hydride) shift, breaking the weak N-O bond. The second step involves trapping of the carbon with water (forming an amide) or, if a hydride shift occurred, deprotonation of nitrogen to give a nitrile. Examples: Notes: The Beckmann rearrangement is achieved by converting the oxygen of the oxime to a good leaving group, and then heating. In the first example, treatment of the ketone with NH2OH forms the oxime, and then in step 2, heating with acid leads to the Beckmann rearrangement. In the second example, after formation of the oxime, it is treated with Ac2O (converting the oxime oxygen to an acetate, a better leaving group than OH) and then heating. The third example is a Beckmann rearrangement on an oxime derived from an aldehyde, which results in a nitrile. Mechanism: The first step in the process is formation of an oxime from the aldehyde or ketone, which occurs in a sequence similar to formation of imines and hydra zones. In the first step, the nitrogen adds to the carbonyl carbon (Step 1, arrows A and B) followed by proton transfer (Step 2, arrows C and D). Then, the lone pair of nitrogen displaces the hydroxide in an elimination reaction (Step 3, arrows E and F) and finally the nitrogen is deprotonated by base (Step 4, arrows G and H) to give the oxime. 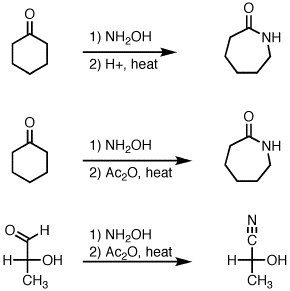 In the Beckmann rearrangement step, the oxime oxygen is protonated by acid (Step 1, arrows A and B). This leads to formation of OH2+, which is a much better leaving group than OH . Now comes the key step, rearrangement. The C-C bond breaks, migrating to the nitrogen, forming a new C-N bond and displacing the water as a leaving group (Step 2, arrows C and D). This forms a free carbocation, which is then attacked by water (Step 3, arrow E). The positively charged oxygen is deprotonated by base (Step 4, arrows F and G) to give the tautomer of the amide. Steps 5 and 6 represent “tautomerization”. First, protonation occurs at nitrogen (Step 5, arrows H, I and J), followed by deprotonation of oxygen (Step 6, arrows K and L). This gives the amide. Notes: The key rearrangement step (Step 2) is similar to the rearrangement step in other rearrangement reactions (such as hydride and alkyl shifts, as well as the Curtius, Schmidt, and Wolff rearrangements). This is an alkyl shift, accompanied by loss of the leaving group. The purpose of the acid is to make the oxygen a better leaving group; the O-N bond is weak. Note that although HOSO3- is shown as the base here, it’s very possible that other species can act as the base. Also, the ‘proton transfer’ step shown in oxime formation can be shown as two different steps, instead of the one. For nitrile formation, the key step is a hydride shift, followed by deprotonation of the nitrogen. This gives the nitrile. In one of the Beckmann rearrangement questions the reagent given was NH2OH.HCl , PCl5 and heat. What does PCl5 do? Same function as acid. Makes the OH into a good leaving group. Does SOCl2 do the same function? You can use instead of Acid (H2SO4 ,HCl ) —-PCl5 , SOCl2 , BF3 , POCl3 , SO3 . These all have same functions. Even PCl3 , PCl5 , SOCl2 , Al2O3 , and P4O10 will do the work here ! Hi Brad – NaHCO3 is just to neutralize the conjugate acid here. In a version of this reaction in which ring expansion occurs, does it do so with the same regioselectivity as say the B.V. oxidation? By that I mean I’m under the impression that the oxygen added in expanding a ring will generally add to the more substituted side (though that may be incorrect too). Will the NH group do the same, assuming the molecule allows it to? My specific example is a benzyllic ketone, located on a 7-membered ring. But even just a clarification of the generalities would be amazing. By this mechanism, ketone always give amide while Aldehyde give nitirile ? and in this reaction when R1 is ethyl and R2 is methyl or something else (When R1 and R2 is different) which R group is shifted and why? Since the group migration step is similar to that in Curtius, Schmidt, etc : Is it necessary that an aldehyde will always give a nitrile? In case that the Hydrogen to be migrated is not at Trans-position with respect to OH- , wouldn’t that give formic acid derivative of amine? Oximes can interconvert their stereochemistry (cis and trans) so it would still give an aldehyde unless there was some special constraint which prevented the adoption of that stereochemistry. what does ‘good leaving group’ mean here?? What makes a good leaving group? Good leaving groups are weak bases. HO- is not a good leaving group, but once you get into the territory of AcO(-), H2O, etc. then the reaction will proceed nicely. I think you missed a very imp. part(Stereochemistry of the reaction)–that the alkyl substituent “trans” to nitrogen migrates. That is a good point, however oximes can invert their stereochemistry through an intermediate nitroso. Why does C atom in carbonyl react with nitrogen in hydroxylamine, not oxygen ? Can you explain it to me ? What’s the difference between using NH2OH and its acid salt NH2OH.HCl in the formation of the oxime? None, but with the HCl salt, you’ll need an equivalent of weak base to neutralize the HCl salt so that the lone pair on the nitrogen can be freed up. If oxime was prepared from a unsymmetrical ketone which alkyl grp migrates? Migratory aptitude roughly correlates with carbocation stability. Let’s say we’ve got methyl group on carbon 2. Which carbon would do the rearrangement? C2 (more substituted) or C6? Thank you! Migratory aptitude increases with carbocation stability, so likely the more substituted. All that’s happening is that PCl5 is attaching to the OH of the oxime. Different way of making it a good leaving group. What if we react Ketone with NH2OH and then perform reduction with LiAlH4? LiAlH4 is a sledgehammer. Not only will you reduce C=N, you’ll reduce N-O as well. End product is the amine. Why does an electron withdrawing group present on the migrating group retards the rate of beckmann rearrangement? Really need to clarify this point. Migratory aptitudes generally increase with carbocation stability. Carbocation stability decreases as electron withdrawing groups are added. One can think of the transition state in the Beckmann as a 3-center, 2-electron bond, which is electron deficient. It’s very bad practice to depict intramolecular proton transfers if they go through 3 or 4-membered ring transition states, as you did in step 2 of the oxime formation mechanism (4-membered ring transition state). You should instead depict two proton transfer steps involving hydroxylamine as a proton shuttle.